Well who knew that blogging was such a communal activity? Turns out it’s NOT just a bunch of people sitting alone at their computers, sending their words out into the Blogosphere, never knowing if anyone reads their carefully-crafted prose. Thanks to Marianne, who somehow found my first tentative steps into Spanish blogging, I have been able to connect with other bloggers about Andalucia, read their thoughts, stories and philosophies, and enjoy their photos. And then along came this brilliant idea from Marianne – a monthly challenge which would further connect bloggers and widen everybody’s readership. 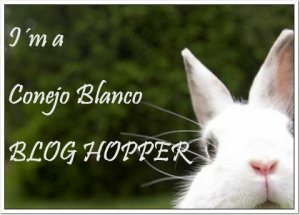 Based on the old superstition that we must say “White Rabbit” before speaking any other words aloud on the first of every month, the challenge is called the Conejo Blanco Blog Hopper. Conejo Blanco is the Spanish for White Rabbit, and the Blog Hopper part is that we need to provide links to two other blogs that we read and enjoy. Marianne sets a theme on the first day of the month, and then participants have the whole month to take (or find in our archives) a photo that illustrates the theme. For August the theme is “Looking Up”, and her own blog shows some wonderful examples of creative photograpy from a different perspective. Then I had to learn was how to insert links to other people’s blogs. 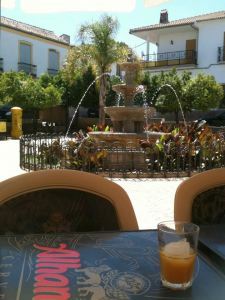 The links I offer you this month begin with Marianne’s “East of Málaga” blog at http://eastofmalaga.wordpress.com. Marianne is, of course, the creator of the Conejo Blanco Blog Hop photo challenge, and what a lovely idea it is. On top of that she writes a wonderful blog based in my own Axarquía region, illustrated with her brilliant photos. The second link I offer you is http://andaluciaexplorer.blogspot.co.uk/ Rachel, like Marianne, combines writing about our beautiful region of Andalucia, with superb photographic illustrations. For me this photo is a great representation of the place I have chosen to call home. Colmenar is bright and clean, Plaza España is a great place to enjoy a drink under the watchful gaze of the Ayuntamiento, and this picture looks up towards Calle del Cura off which can be found Rincon de las Flores – my own little corner of Andalucia. But perhaps more “on task” is this next picture. Trying desperately hard not to copy either Marianne’s or indeed the many famous pictures of Frigiliana, I spent a lovely afternoon there looking upwards (and managing to bump into people only once ….. or maybe twice …..), and I offer this one as my favourite. It seemed to me to be a slightly different angle from the usual ones. Thanks so much Marianne for setting such an interesting theme! Maybe in a few months time we could do “Looking Down” !!! This entry was posted in Conejo Blanco Blog Hopper, Spain and tagged Andalucia, Colmenar, Connejo Blanco Blog Hopper, Spain, SpanishBlog, Tamara Essex by tamaraessex. Bookmark the permalink. Hi Tamara, thank you and I like your photos! 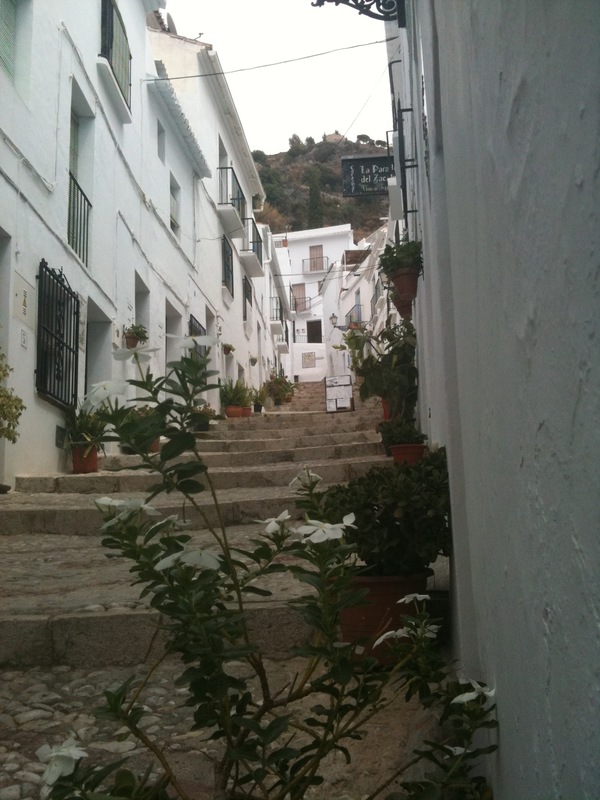 Frigiliana is popular isn´t it? I have some great shots ´Looking Up´ narrow cobbled streets in the old part of town too, didn´t like the new sprawl though. Did you get to Achbuchal the lost village near there – a beautiful mountain track? Blogging is fun and addictive – are you on Twitter? Another new addiction of mine – let me know if you are I´m @spaniola. Here´s to new friends and blogs! Well, what a lovely job you have done for this month´s challenge, Tamara. Your writing style is so natural and your photos are perfect illustrations of “Looking Up” – the theme for August. Your blog has come along in leaps and bounds since a first found you only a couple of months ago. It´s fun finding out how to do new things, isn´t it? And, who knew that blogging was such a social activity? I have friends all over the world as a result of blogging. I´ve met a few of them too – in Australia! Yes I agree you are so natural I had no idea you were just learng the skills. I have tried my hand at his blogging but can not figure for the life of me how to insert a picture. I will give it another attempt later. I have just said farwell to my friends from Vancouver so I have a lot of free time. cheers , enjoying reading your bloggs.